Adolf Hitler / Nazis hated Arabs as an inferior “race”, yet praised Islam in its ‘war like’ TOTALITARIAN ideology | Free Israel! This entry was posted on April 26, 2009 at 5:39 am and is filed under Arabs, History, Hitler, Mufti, WW2. You can follow any responses to this entry through the RSS 2.0 feed. You can leave a response, or trackback from your own site. I wonder how new revelations about Hitler just EMERGE like this when researching that bit of history is out lawed. Muslim Bosnian emigrants would tell you that Jews were not the only victims of the holocaust. 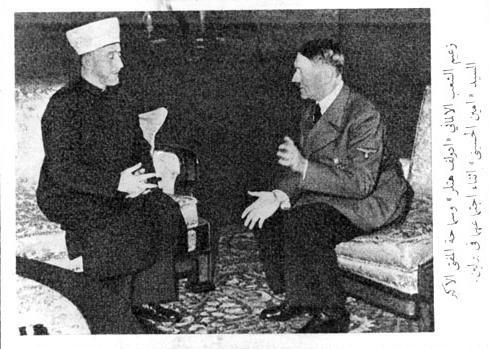 Hitler’s aversion towards Arabs in particular was never a secret. Amin Al-Husseini was only trying to defend his homeland from the Zionist invasion and the on-going ethnic cleansing of Palestinians off their land. The newly revealed pictures of Amin Al-Husseini are clearly fake, and the information is far from accurate. 1) al-Husseini started hsi ethnic cleansing attempt, or rather extermination attempt campaign in the 1920s already, ‘Kill the Jews wherever you find them, this pleases Allah,” the Islamic-fascist leader called. 2) I don’t now what you are saying about the Bosnian SS troops that the infamous Mufti was leading against the Christians and the Jews. 3) And what “research” is banned? Even your despicable miserable comment was also posted.